Our office can provide low level laser therapy (LLLT). This new therapy is very effective at calming nerve pain and relieving chronic muscle pain. It has also been shown to be effective in the treatment of a number of other conditions, such as TMJ and headaches. We can combine LLLT with additional treatments such as Chiropractic adjustments, specialized exercise programs, massage, traction and nutritional supplements. The laser is currently the most advanced of source light. The word LASER is an acronym for Light Amplification by Stimulated Emission of Radiation. Cold Lasers for treatment has been well tested in Russia, Switzerland, Hungary and Japan. 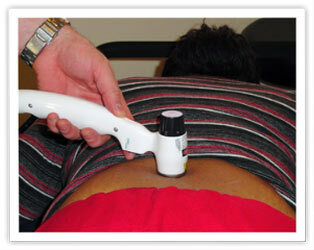 Only recently, 2002, the FDA approved the use of cold laser in the United States. For this reason, very few hospitals or clinics are even aware of the amazing benifits of laser treatments. The FDA considers the laser to have no significant risk (with the exception of vision loss, if you stare into the laser light, of course). The laser appears to have significant benefit in the treatment/management of many conditions. This includes: Carpal tunnel syndrome (officially approved by the FDA), trigger points, fibromyalgia, tendonitis, bursitis, meniere's disease, tinnitus, vertigo, wound healing, sciaticia, scars, migraines, herpetic neuralgia, TMJ, rheumatoid arthritis, and even balding. It is clear that this list could be much longer and will continue to grow with experience. Many people (including many doctors) think that Cold Laser could not be very effective since they haven't heard much about it. This is a shame because many people could be helped with this amazing treatment option. Copyright 2003 Bates Communications. All Rights Reserved.